From August 30th to September 3rd, Polito (Polytechnic University of Turin) and Unito (University of Turin) carried out geophysical surveys in the area of the Bowditch Lake (Col d’Olen area, Western Italian Alps, 2901 m asl). The research site is a node of the Long-Term Ecological Research (LTER) network in Italy (http://www.lteritalia.it). 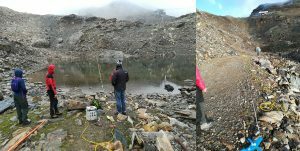 The main goals were to understand the subsurface structural characteristics of the lake and the surrounding slopes and to investigate the thickness and characteristics of the subaqueous soil.